When USC lost its final 10 games of last season and staggered to a 6-26 record, a flurry of injuries provided coach Kevin O'Neill with a convenient yet credible explanation for his team's poor performance. O'Neill had no such excuse for the Trojans' underachieving 7-10 start this season, and thus he was fired Monday morning. Assistant coach Bob Cantu will take over on an interim basis the rest of the season. The timing of O'Neill's dismissal is far more surprising than the fact USC chose to part ways with the fourth-year coach. After underachieving the first two months of the season, USC had shown signs of life in Pac-12 play and was coming off its best performance of the year, a 76-59 road win at Utah on Saturday. Ironically, it's possible that performance may have hastened O'Neill's exit. One reason for a coach to be fired at midseason is if administrators have decided he's not the longterm solution for the program but they fear a second-half turnaround could make it harder to justify firing him at season's end. "I appreciate the opportunity I had at USC," O'Neill said Monday. "It's a great institution and there are some great people there. I don't have anything except good memories. "I met with Pat Haden and Steve Lopes at 8 a.m. and they informed me they were going in a different direction. I really wasn't surprised. You know, it's part of the business. They made a decision they thought was in the best interest of the program, and I respect it." O'Neill's firing ends an era of USC basketball that will be remembered for stingy defense, erratic offense and ultimately not enough victories or fan support. 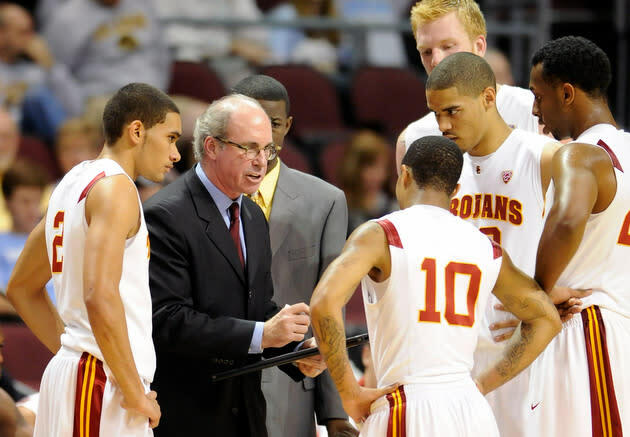 Hired by former USC athletic director Mike Garrett in 2009 to clean up a program facing NCAA scrutiny after Tim Floyd's tenure, O'Neill got the Trojans to play hard despite a postseason ban his first season and led the team to the NCAA tournament the next year. A season-ending knee injury to standout guard Jio Fontan in the preseason and midseason injuries to big men DeWayne Dedmon and Aaron Fuller left USC woefully shorthanded by the start of Pac-12 play last year, contributing to a 1-17 finish. Many thought new USC athletic director Pat Haden might cut O'Neill loose after that, but he didn't think it was fair to evaluate the coach when he never had a full complement of players. As a result, O'Neill got another season, but with the understanding that there was pressure for the Trojans to succeed. Though the return of Fontan and an influx of talented transfers inspired preseason hope that USC could compete for an NCAA bid, there were some red flags even before the year started. Some questioned O'Neill's commitment to the program when he revealed he would be living in San Diego and making a 90-mile commute to Los Angeles every day. O'Neill also lost a key contributor when guard Maurice Jones, USC's top player the previous year, left the program before the season started. With Fontan lacking his previous explosiveness, Wake Forest transfer J.T. Terrell struggling with his shooting and shot selection and the big men lacking polish offensively, USC has once again struggled to score consistently enough. The Trojans struggled against a brutal schedule in November and December but also lost to UC Irvine, Georgia and Nebraska, effectively killing their NCAA tournament hopes before the new year. "I really don't have any regrets," O'Neill said. "I'm disappointed for the players and wish I could have helped them more, but it's part of the business. Decisions are made every day. Everyone's got to move forward." O'Neill has a well-deserved reputation as a brilliant tactical coach, but his tenure is proof that Xs-and-Os alone won't win in today's college basketball. His prickly demeanor and structured style of play wasn't appealing enough to either fans or top prospects, and even in down period for UCLA basketball, he wasn't able to recruit Los Angeles well enough to capitalize. The Southern California players UCLA was missing out on ended up at Colorado, Oregon, Arizona or in the Mountain West but rarely at USC. Whoever replaces O'Neill at USC will have to reverse that trend. The job should be fairly attractive to potential coaches considering the Trojans have a built-in local talent base and sparkling new facilities. USC is notorious for sparse basketball crowds, but decades of mediocrity have conditioned the alumni to expect modest hoops success at most. O'Neill couldn't deliver that — and that's why he has been shown the door. He hasn't ruled out a return to coaching, but right now he intends to return to San Diego and enjoy some time with his family. "Right now, I'm going to go for a run on the beach, hang out with my wife and have dinner tonight," O'Neill said. "I'll figure it out from there."